Ladies and luck have always gone together at the casino; now they come together to bring you comedy. 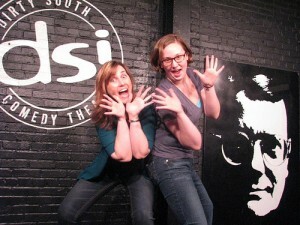 Performing: Thursday, June 7th, 9:00 p.m.
Lady Roulette is an improv comedy show starring Katy Jack and Paula Pazderka. Over the past year, these two have developed a unique connection and definite sense of weird that lends a special quality to their performances. It’s comedy by women, but not necessarily just for women. Using strong characters, a well-developed sense of game, and a lot of balls, Lady Roulette creates 15-20 minutes of comedy based off of a single audience suggestion.